FocusNeo has a long tradition of sign manufacturing and has been helping customers with visibility and visual communication since 1965. 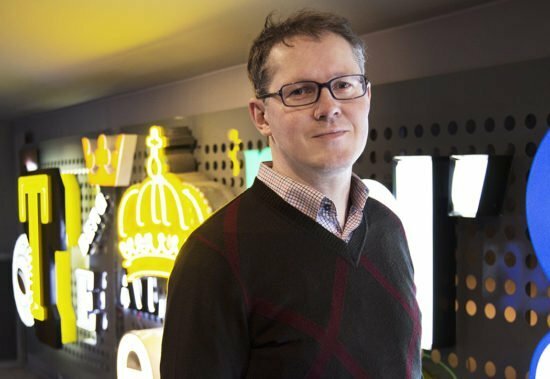 This collected knowledge and commitment is personified when I talk to Fredrik Billmark, who has been in the sign industry for 20 years, of which 10 were spent with world-leading sign manufacturer Maas & Roos AG in Germany. For the last 10 years he’s been with FocusNeo in Stockholm. 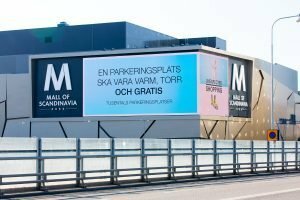 Fredrik – how did you end up in the sign industry? By accident, actually – I studied in Munich and wanted to stay after my studies to learn more German. I saw a job advertised, applied and that was how it all began. 20 years later I’m still here and I’ll probably still be in the industry in another 20 years. At least! What have you done during your first 20 years? During my time at Maas & Roos, I had several roles, but I mainly worked with Scandinavia, and FocusNeo was my biggest customer. Much of my work consisted of drawing up documentation for quotes and developing technical solutions for various sign projects. When I started at Maas & Roos, the industry was completely different. Technical progress has been very fast. In the middle of the 1990s, most signs were still manufactured with neon or fluorescent light sources. Letter profiles were made from 15-20 cm deep sheet metal and we had our own glass blowing facilities for producing neon tubes. Today, technology has created completely new possibilities and the introduction of LED technology means signs can be made significantly thinner and more elegant. In addition, LEDs save an incredible amount of energy compared to neon and traditional fluorescent tubes. One great memory from that time was that I delivered the first LED sign to FocusNeo in Scandinavia. Ericsson ordered signs with white LEDs for its offices in Sweden and Denmark. These signs laid the foundations for our premium technology, LPFLEX, which is primarily used in sensitive urban areas and indoor environments where light quality and evenness are extremely important. Why did you leave Germany? In around 2006 I felt homesick and FocusNeo wanted to take advantage of my experience and knowledge, so I moved back to Stockholm again. Since then my responsibilities have included production, purchasing and installation planning, but now I have a role more like the one I had in Germany. I help our salespeople with calculation information and complex quotes and that brings me closer to our end customers. You’ve been involved in many enjoyable projects – can you think of any that were particularly interesting? Definitely. The great variety in customer projects is the best thing about my job. I particularly enjoy projects where innovation leads to satisfied customers and good business. 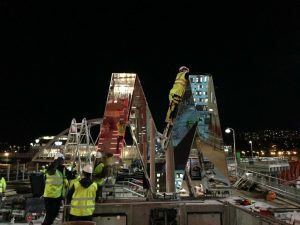 One dream project I’ve already completed was the renovation of the NK clock in Stockholm. 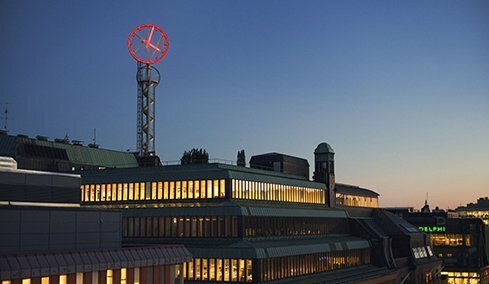 This is a classic Stockholm landmark, and we replaced all the old neon tubes with LED technology. No drawings were available, so we had to work a lot by feeling, but the end results were amazingly good. The most extensive project I’ve been involved in was the reprofiling of SpareBank1 in Norway. I had to move to Oslo for six months, in 2008, so I could manage the project. We profiled over 450 banks across Norway, from Stavanger to Hammerfest. It was tough going, but a really enjoyable project. Because I often get involved in projects with roof signs or façade signs, I also often get the chance to see many cities from high above. We did a really high up job when Dagens Nyheter (DN) celebrated 150 years. We helped put an anniversary sign on top of the DN tower in the form of a chat bubble with the text ‘150 years’. The bubble was linked to the existing ‘Dagens Nyheter’ text and only appeared with that and not with ‘Expressen’, which is written on the same building. It was an enjoyable job, but not for anyone who’s afraid of heights! As sustainability manager for FocusNeo, you run the company’s environmental work – why is that so important? Sustainability is one of FocusNeo’s key areas and working to achieve the least possible environmental impact is important from a long-term perspective. FocusNeo became environmentally certified back in 2005 and has renewed its environmental diploma every year since. Our environmental work applies both to how we work with our own internal routines and in terms of the products we deliver. Products are supplied with LED technology and we continuously work with our suppliers to develop ever more energy-saving solutions. With many deliveries across the Nordic region, efficient transport is also a critical factor. Therefore, we coordinate our shipments weekly from the factories to our branches in the Nordic region, thus reducing both emissions and costs. We are also gradually replacing our vehicles with so-called super-green cars and more than 50% of the vehicle fleet is now electric cars or charging hybrids. 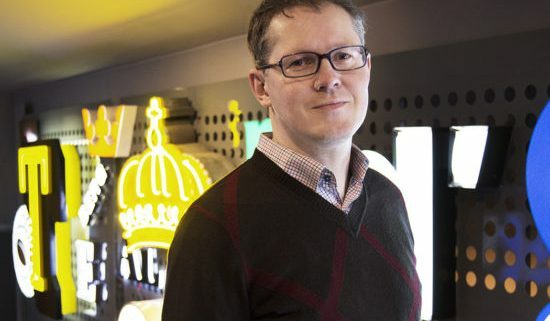 But active environmental work means that we look at the whole business, and at the moment we’re looking into whether we can replace fluorescent tubes in the office with LED technology. Even small details can make a big difference. Finally: Do you have a favourite place for “signspotting” that you’d like to share? I think there are probably two places. 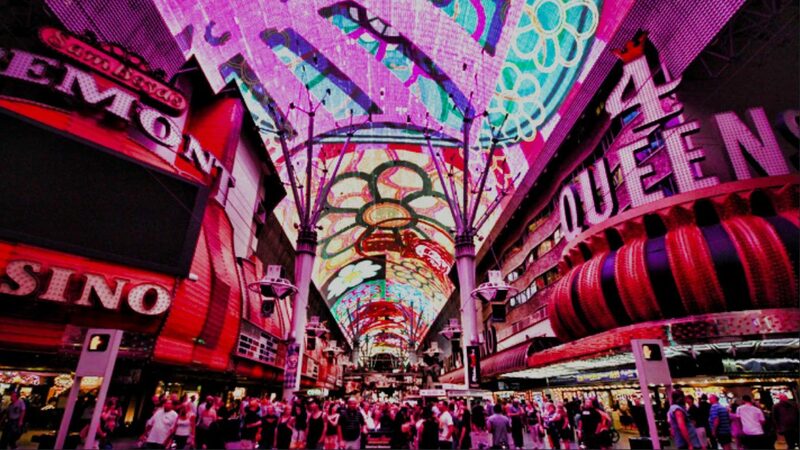 The extremely flashy, sign-packed Fremont Street in Las Vegas is incredibly impressive. The canopy consists of one of the world’s biggest LED displays to date and displays amazing shows with both light and sound. It’s well worth a visit even if you aren’t particularly interested in signs.